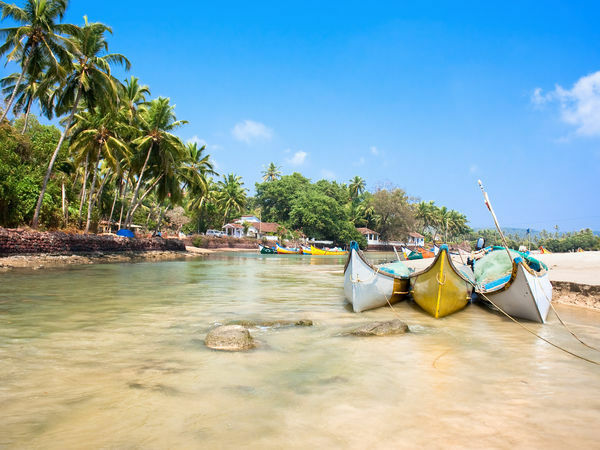 Sheltered by a rocky foreland and tucked at 10 km of distance from Mapusa, Baga Beach in Goa is a lovely retreat house and paradise for nature buffs. It’s a long sandy beach packed with lively shacks, resorts and fishing boats. Being quieter and isolated, it stands among high hills and deep blue Arabian Sea. Wandering all around and relishing several souvenir shops to the best party’s center of the city, the captivating beach offers a wonderful retreat with a wind of vibrating energy. Whether it’s the endless drink & food or the water sports, this beach is full of life and one can enjoy every bit of second, being in the lap of nature. Baga usually figures high on tourist routes due to its exciting nightlife, flea market, eateries and watering holes. Popular for its shack life, many food and drink joints are provided by St. Anthony’s for delicious seafood and the well-known Cafe Mambo and Tito’s Bar for the night-time revel. The beach provides a plethora of options for the one who is looking for some escapade. Spend some memorable time in the lap of nature, leaving back all your stress and worries. Situated amongst the tranquil surroundings, the beach offers mesmerizing view of glistening white sands, sky blue water and swinging palm trees. It’s one of the favorite hangouts for nature enthusiasts, where one can relish the scenic beauty of a place. For couples, a candlelit dinner at the beachside is a perfect retreat for making it a romantic Baga beach holidays.